Are Thomas Arnold and his wife Rachel (possibly Smith) the parents of Lucy? Do Thomas Arnold’s deeds provide clues about his wife’s family (possibly Smiths)? As I looked at the date of my last post, I had to admit, it is NORMAL for a year to go by with no news. This “brick wall” is pretty strong but, I think, solvable. I am related to Lucy Arnold in the following way: my grandmother Edna Darling –> Russell Darling –> Addison Parmenter Darling –> Ellis Aldrich Darling –> Nancy Anna Aldrich –> Mercy Ballou –> Lucy Arnold. 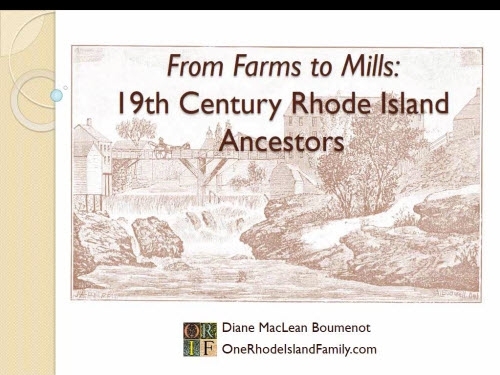 My current strategy is to examine deeds from Smithfield, Rhode Island to see what I can learn about Thomas Arnold’s life, and also to compare these details with other sources of information like tax and census records. On my recent trip to the Family History Library I had a chance to save about 21 deeds from Smithfield, Rhode Island, of property transactions under the name of Thomas Arnold. Once I got the copies home, here is what I did. Sample of Thomas Arnold deed as it appears in the Smithfield Deed records. I re-read the chapters on deeds and probate from Val Greenwood’s The Researcher’s Guide to American Genealogy. (Third Edition. Baltimore: Genealogical Publishing Company, 2000.) Always good to know what a messuage is (a dwelling) and in this case, the definitions of rod (16-1/2 feet), chain (66 feet), and link (7.92 inches). Mr. Greenwood always has excellent advice. I reviewed each deed closely for clues that they referred to OTHER Thomas Arnolds. I eliminated seven deeds, leaving 14. I abstracted the fourteen deeds into about 6 pages of notes. I abstracted the notes into a chart. The chart is color coded by likelihood of a match to Thomas Arnold. Columns for the 14 deeds include date, entry info, Seller, Buyer, acres, price in pounds, witnesses, neighbors mentioned, and Landmarks and notes. 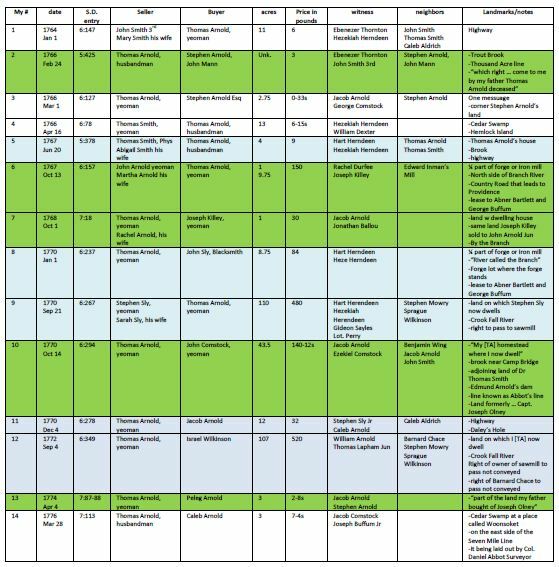 A READABLE pdf version of the chart is HERE. The five deeds colored in green seem to me to definitely belong to Thomas Arnold. The five marked in blue are additional deeds ascribed to this Thomas Arnold in Richard Benson’s book, The Arnold Family of Smithfield, Rhode Island (citation below). The remaining four, in white, may very possibly refer to Thomas Arnold. I will go through these one by one and give the best evidence only. I really can’t rule any of these out. I investigated the persons mentioned below primarily through my own tree and the sources cited at the bottom of the post. 1764 – Seller is John Smith 3rd and his wife Mary Smith. While common names, I suspect the Mary is Mary Phillips, who would be a cousin of Lucy Arnold’s future mother in law, Elizabeth (Phillips) Ballou. I am unsure of the Smith connection. 1776 – Witness George Comstock is married to Thomas Arnold’s sister, Catherine. 1767 – Sellers Thomas Smith (physician) and his wife Abigail (Aldrich) were neighbors of Thomas Arnold. I had a theory this couple could possibly by Rachel’s parents. But after finding the wills of Dr. Thomas (1777) and Abigail Smith (1783) online (THAT was lucky, thank you, Dan!) , I suspect Rachel was not their daughter. 1767 – Seller John Arnold (married to Martha Bucklin) was Thomas Arnold‘s half-brother. 1768 – This is the only deed where Thomas Arnold‘s wife Rachel is also on the deed. 1770 – The witnesses (the Herendeens) appear in several other deeds as witnesses. Other than that, no clues. 1770 – Witnesses Jacob Arnold was likely Thomas‘ cousin (son of Joseph Arnold). 1770 – Buyer Jacob Arnold, named in #10. Witness Caleb Arnold, also likely a cousin (and brother to Jacob). 1772 – Thomas Arnold sold a large property, that he lived on, to Israel Wilkinson. 1774 – Thomas Arnold sold a tiny amount of property to his uncle Peleg Arnold. Witness Joseph Buffum was married to Thomas Arnold‘s half-sister, Lydia. Buyer Caleb Arnold was the cousin mentioned in #11. A general note about the names – several named individuals who are not closely related to Thomas Arnold seem to be descended from the Eleazer Arnold branch. This could be a coincidence (I believe they were among the wealthier inhabitants) or perhaps Rachel is related to them. 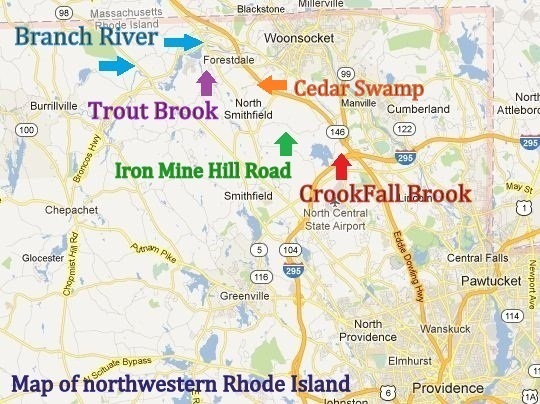 The place clues I found included Trout Brook, Thousand Acre Line, Cedar Swamp, Hemlock Island, iron forge, iron mill, the Branch River, forge, Crook Fall River, brook near Camp Bridge, Edmund Arnold’s dam, Daley’s Hole, cedar swamp at Woonsoket, Seven Mile Line/Abbot’s Line. Originally, Smithfield encompassed most of the area north of Providence. Map courtesy of Google maps. I am not getting a lot of information from my attempt to match some locations. But if I could compare it to a map of the early Smithfield homesteads, it might be helpful. 1765 [note: Thomas Arnold was 32 years old] – Thomas Arnold’s father, Judge Thomas Arnold, died in 1765. His grandfather, Hezekiah Comstock, died in 1764 and made a bequest to him, among many others. The judge divided a forge among several heirs; the details are not clear to me since I haven’t read the probate record yet (there were mentions of it in the Arnold book). 1767 – Thomas Arnold bought a quarter share of a forge and some property from his half-brother John Arnold for 150 pounds. 1770 – Thomas Arnold sold a quarter share in a forge to a blacksmith for 84 pounds. 1770 – That same blacksmith sold 110 acres of land and his dwelling to Thomas Arnold for 480 pounds. 1772 – Thomas Arnold sold “land on which I now dwell” and 107 acres to Israel Wilkinson for 520 pounds. 1774 – the 1774 state census shows a Thomas Arnold family of six. 1778 – The Smithfield 1778 tax record shows only one Thomas Arnold, with property (a horse) worth 12 pounds. 1790 – Thomas Arnold is not in the federal census of 1790 in Smithfield. 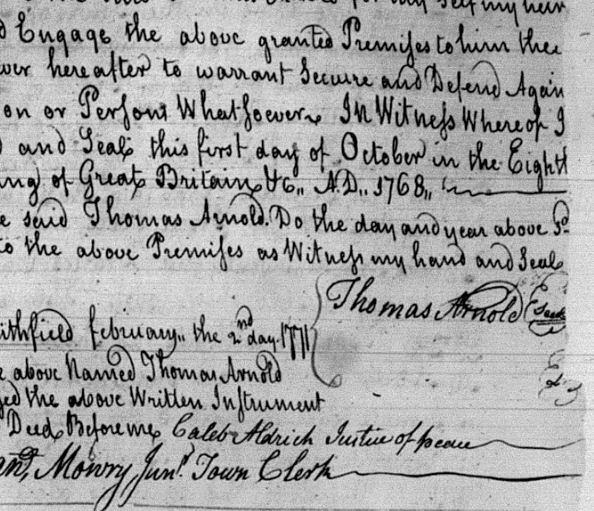 The death dates and burial records of Thomas and Rachel are unknown to me and I’ve never found a probate record. Did they become impoverished, or ill? Did they move elsewhere? Did they move in with family? There are few or no vital records for this family; most books put details together from other records. 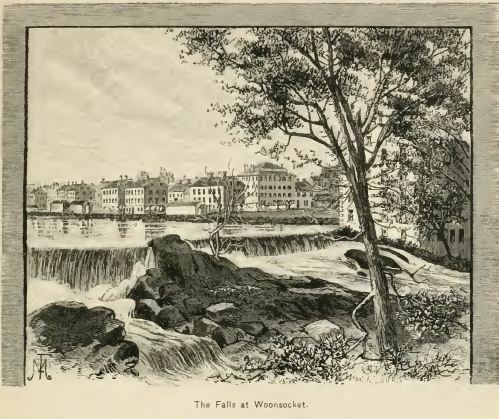 The Falls at Woonsocket, an 1870’s view, from Picturesque Rhode Island by Wilfred Munro. Many types of manufacturing, particularly textiles, sprang up in Woonsocket after 1810. Visit Smithfield and explore each of these places more thoroughly; visit the public library there. Investigate the possibility that Thomas Arnold left Smithfield for a nearby town or possibly near other relatives in New York state. Try to find a probate record and see if Lucy or Lucy’s children are mentioned. Explore the impact of the Revolutionary War on Smithfield and its soldiers. I don’t think Thomas Arnold died as a soldier. Was he disabled? Several of Thomas’ siblings were Quakers. Explore Quaker records at the RI Historical Society. Read Thomas Arnold’s father’s probate record – probably on microfilm at the RI Historical Society. Investigate every Rachel living before 1730 in or near Smithfield (any area on the north side of Providence, at that point). Rachel may well have been named for someone. Keep investigating every name on the deed grid I made. I suspect someone on there is closely related to Rachel, and it’s not the ones I thought. There are some Arnolds from the “Eleazer” branch – could Rachel descend from them? Cast a wider net around the Dr Thomas Smith and his wife Abigail mentioned in some deeds. I now know Rachel is unlikely to be their daughter, but may be related. Find early maps of Smithfield homesteads. 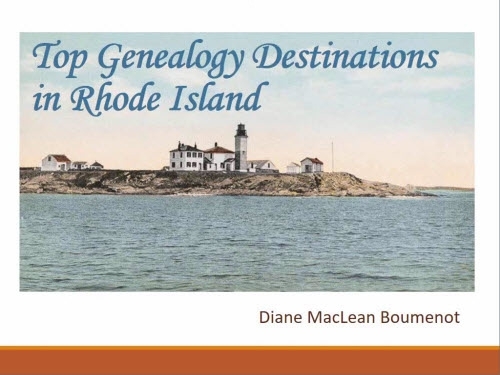 Keep exploring the Providence Gazzette, available on GenealogyBank.com for this period. Move in the other direction, and learn more about Lucy Arnold and Richard Ballou. They moved to a different section of town, but perhaps one of her relatives also moved near them. As I learn more about these people, places, and resources, I find myself growing more curious and knowledgeable, and making connections easily. I would say my work on this one is about 35% done. So while not a “success” story yet, it IS moving along in the way that many tough problems do. It’s difficult to read the stones – and they’re in quite a state of disrepair – but it’s definitely the Comstock family. with legible stones dating from 1804 – 1900. I was googling Comstock family and came upon your search for Thomas Arnold. I most appreciate your research and the information you share is outstanding! Thank-you for this lovely work! I am enjoying reading about my family line, the Arnold’s. My grandfather was Robert Arnold Boyd, and lived in Indiana. I have read about the Arnolds in Rhode Island. You really inspire me! I am on Long Island, NY and I do go to Newport every year. Now I hope to visit more towns! Thanks Joan! 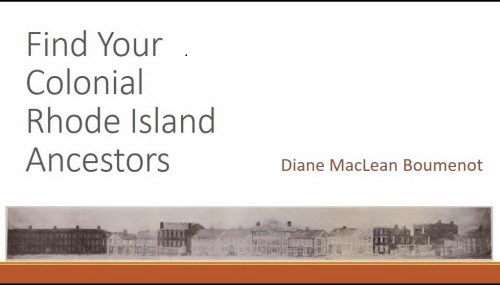 Have you determined whether you are from the Benedict Arnold line (first Governor of RI; great grandfather of the more famous person by that name) or the Smithfield Arnolds? Diane, I’m sorry for the late complement on your superb post. And congratulations on making Randy Seaver’s list of top weekly blogs. Thanks Barb!!! I have a feeling that in this post lies the clue that will eventually prove something about all this. Just don’t know what it is yet!! And by the way, nice to see your interesting post mentioned there as well! I really enjoyed that. With landmarks, the question is whether to put in only an abbreviated list or a full description. Full descriptions though take up lots of space on the screen and in print making it difficult to see things at a glance. Also it often is necessary in my experience to go after more transactions for a property after the last sale involving a person of interest. Sometimes that is the only way to get a good land description in a metes and bounds state, and sometimes one finds references to earlier deeds (see NGSQ articles showing this methodology). Sometimes too I will do a hybrid chart incorporating other records directly instead of just in a written analysis, especially tax records. This allows comparison of tract sizes and possibly adjacent owners, and is very helpful in cases of “missing deeds” where one suspects a deed among family or friends was left unrecorded (another reason to track subsequent transactions for a property). Land analyses are difficult and tedious but really can help break down a wall. Sometimes though they are somewhat inconclusive, as when you can only prove one child who received a small tract and must have paid his/her parents or siblings in cash and left no record of the transaction (missing deed problem again). Even in such cases at least you know you have left no stone unturned. Good luck with your continued research. Thanks Mike. So many good ideas mentioned in your remarks. These deeds disappointed me in some respects but you have some interesting tips I may still try. Probably my biggest disappointments were the use of stumps and trees as landmarks and the few neighbors clearly described. This contrasts with the Westerly Rhode Island deeds that helped me recently. Since I wrote the post I have made one or two additional connections to the people mentioned. Your diligence in reviewing and finding all the deeds, tax records, wills, etc., is inspiring. I like that we share some family connection and enjoy your blog. Thanks so much Val. I’ve learned to put the line of descent near the top so people know if a certain group is related to them. I suspect what I found WILL be helpful in the future, but so far, not solving anything. I definitely need to learn and persevere with how to work with land records! My brick walls are centred on upper New York state, and my mental wheels grind to a halt every time I get started in land records. Your very methodical logical process and analysis is extremely helpful, Diane. Much appreciated. Good luck with that Celia! I definitely will be doing much more of this. One thing that is confusing when you are NOT in Salt Lake City is that the indices may be on separate microfilm rolls from the actual records. I suspect it will be a grueling process! on January 31, 2013 at 12:14 pm | Reply Peggy L.
Wow! This is an excellent post! I have now read it twice to make sure I gleaned everything from it. I LOVE working with land records, so this is right up my alley. Peggy, thank you, and I agree … land records are potentially amazing. I hope we have made some converts here today! Many such records can be ordered on microfilm at the local Family History Center (I think they’re called Family Search Centers now).